The answer for the utility sector is “no” except for 2 stocks or 4% of the market value of the sector: DPL Inc. (DPL – attractive rating) and Public Service Enterprise Group (PEG – attractive rating). There are no other attractive-or-better-rated stocks or ETFs in this sector, which means investors should avoid or sell everything in the sector except for PEG and DPL. Nevertheless, there are at least nine utility sector ETFs. These nine ETFs have drastically different stock holdings and, therefore, allocations. The lowest number of holdings is 22 while the highest is 85, per figure 1. The takeaway from the figure above is that investors cannot trust the labels that Wall Street puts on investments any more that you can trust the ingredients in packaged foods. Smart investing requires knowing the ingredients of what you are buying just as healthy eating requires knowing what is in the food you eat. I studied the ingredients of the utility sector from the ground up, which means I studied the footnotes for each company within the sector and built a model for each company. Then, I aggregated all of the company models to assess the overall sector and how it compares to the other nine sectors of the economy and the S&P 500. The results do not paint a pretty picture for the utility sector because they reveal that the expected returns of investing in utility stocks do not compare well to the risks. Investors should take note that a good dividend yield is not enough to justify an equity investment because dividends do not accurately represent the true cash flows of the business. In other words, dividends are a use of corporate cash and can come from cash reserves, borrowings or the operations of the business. Free cash flow, on the other hand, takes into account dividends as well as all other capital expenditures. It is the number by which one can measure the financial health of a business over time. Even if the dividend yield by itself is higher than an investor’s required rate of return, the investor cannot trust that the dividend is sustainable. Quite often, a high dividend yield is a function of a depressed stock price rather than a high dividend payment. And the depressed stock price may be signaling that the future cash flows of the business are in for a decline that could force a dividend cut. When I assess the investment merit of the utilities sector, I focus on cash flows and how much future cash flows are required to justify the stock price of every stock in the sector. This approach is the only truly complete approach to fundamental analysis of equity securities. As mentioned above, the results of my analysis are not very positive for the utility sector. Figure 2 shows how the market value of the stocks is divided according to New Constructs rating system. All but 4% of the market value of the sector is in neutral-or-worse stocks. The only two attractive-rated stocks, PEG and DPL, make up only 4% of the market cap of the sector. The utility sector gets my “dangerous” rating and ranks eighth out of the ten sectors that make up the economy. Details are in our sector roadmap report. Figure 3 shows how the ETFs for the utility sector stack up under the microscope of my analysis. There is not a single utility sector ETF that gets an attractive-or-better rating or that ranks better than the S&P. Investors are better of in the more-diversified S&P 500 (i.e. SPY) than any utility ETFs. After reviewing Figure 2, I am not surprised by Figure 3. If there is little market value allocated to attractive-or-better-rated stocks, then there are simply not a lot of good investment opportunities within the sector. 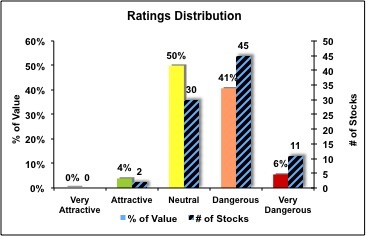 For a utility sector ETF to get an attractive rating, it would have to allocate the majority of its value to the two stocks (DPL and PEG) which make up only 4% of the value of the sector while avoiding the 56 stocks that get a dangerous-or-worse rating and make up 47% of the sector. Such a concentrated investment in two stocks defeats the value of having an ETF. But you cannot trust ETF issuers to tell you that. No, instead, they will serve you up nine very tasty looking utility sector ETFs. Buyer beware. don’t trust the labels that issuers put on ETFs, stocks or any investment vehicle.